Located in the heart of Clements horse country just off Hiway 12, the ranch sits on 20 acres. We have a covered arena for all weather riding, plus round pen and 200X300 outdoor arena.We offer training, sorting practices and workshops, and private lessons with or without cattle. We train for a happy, healthy horse that is a pleasure to ride and be around. 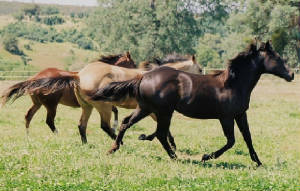 Horses get a variety of work, including moving and working cattle. We work on shaping and suppling your horse, feel, timing and balance for rider and horse for the best ride possible. As part of the Synergy Team, we emphasize your horses overall health and well-being. We work closely with the rest of the Synergy Team: the horseshoer, equine dentist, veterinarian and equine physiotherapist to make sure your horse is capable of attaining its full ability as a working horse while in training. Our training program develops cooperation between horse and rider. 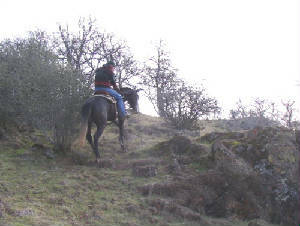 Training, lessons and workshops create a better horse and rider team. We also offer pasture boarding for retired or layup horses, and have a few stalls available for boarding.